The geographic North Pole is in the middle of the Arctic Ocean under ice that's about 10 feet (3 meters) thick, so anything that lives there is typically more aquatic. No known amphibians or reptiles live in the Arctic tundra and polar region, but approximately 20 species of mammals live there. Among the few land animals that migrate to the region are caribou (reindeer) and the arctic fox. The aquatic mammals are beluga and killer whales, sea otters, ringed seals and walrus. Polar bears also hang out around the North Pole. Bears swim up to 100 miles, eating mostly seals and never hibernating except for the female which does take a long rest when she has her cubs. Arctic trekkers are most likely to encounter polar bears on their journeys because the bears are naturally curious - and attracted by human food. Polar bears are increasingly seeking out humans, especially the Inuits who live in the area, because the melting polar ice is shortening the bears' hunting season. So, the bears have to forage for food in new areas that are often occupied by humans. 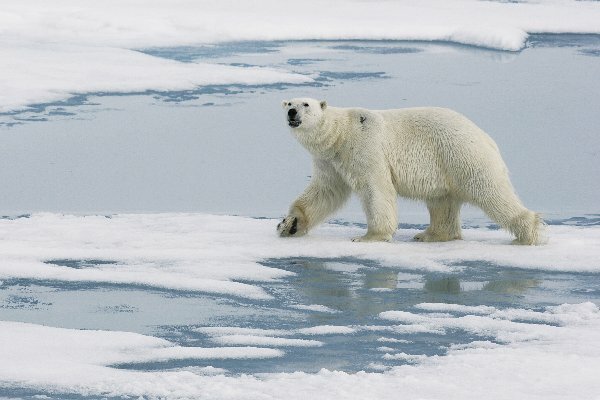 As the North Pole gets warmer, polar bears and other animals are facing extinction. 150,000 bears have been killed in the last 300 years or so with 20,000 to 30,000 remaining. 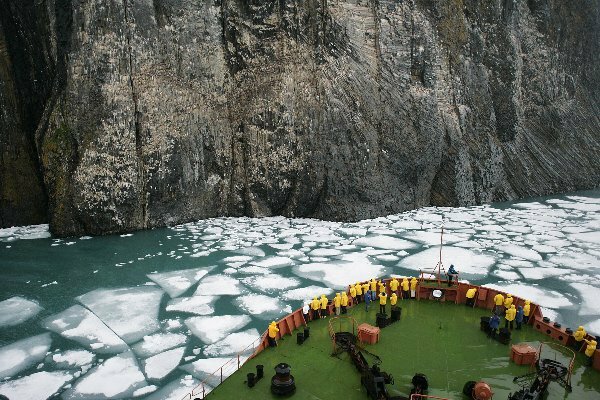 Hunting is no longer permitted except by the Inuit tribes. The major threat is the shrinking ice cap. The bears do not survive well on land because their physiology is seal hunting oriented on the ice. The USA now recognizes them as a threatened species. But the politics associated with saving them is complicated. Polar Bears, Ringed Seal, Bearded Seal, Atlantic Walrus, Humpback Whale, Northern Minke Whale, unidentified dolphin species. Approximately, 100 bird species live in the Arctic tundra and polar region. 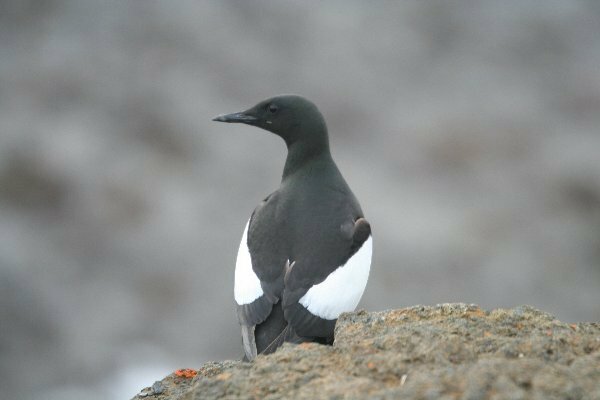 Arctic birds usually spend their winters farther south in the tundra region, but the puffin, albatross, bald eagle, peregrine falcon, ptarmigan, jaeger and snowy owl can all be found in the Arctic. World Traveller - The tern, measuring in at 11 to 15 inches long, migrates from the Arctic to the Antarctic during the Northern Hemisphere's winter. That's a trip around the world every year. 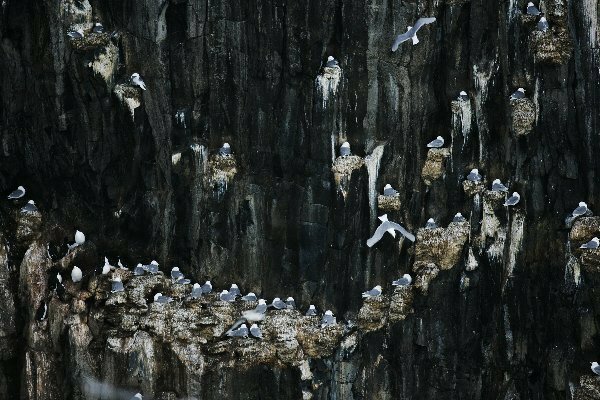 Red-Throated Diver, Northern Fulmar, Common Eider, Purple Sandpiper, Pomarine Skua, Arctic Skua, Glaucous Gill, Black-legged Kittiwake, Ivory Gull, Arctic Turn, Little Auk, Brunnich’s Gillemot, Black Guillemot, Atlantic Puffin, Snow Bunting. There are 400 known fish species swimming in the Arctic Sea, with the most common fish near the North Pole being the arctic cod.